This 5-ingredient sauce is the perfect 5-minute party appetizer! It's got a great kick, and is the perfect dip or sandwich spread! Cut the iceburg lettuce into large pieces so it fits in the blender. Add all the ingredients into a blender (such as a Vitamix). Blend and puree until it becomes a smooth thick sauce. Use a Tamper to push down the ingredients in the Vitamix if using. Adjust the amount of salt and lemon juice if needed. For more or less spice, adjust the amount of serrano peppers. Chill the sauce for about an hour and store in the fridge. 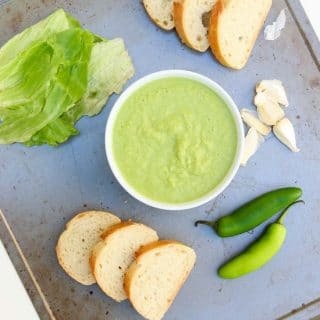 Use it as a dip with french bread, drizzle it over tacos or burritos, or spread it on a sandwich ! The options are endless. This sauce freezes well. Simply take it out of the freezer the day before you're ready to use it, give it a quick whirl in the blender to get the consistency back. Uses - Dip into it with some toasted bread or veggies or spread it on your favorite sandwich.